In yesterday's analysis, we discussed how meaningful gold and silver's pre-market decline was given a relatively small move in the USD Index. The implications were quite bearish for the PM market, especially that we had just seen a target being reached in gold stocks. And because mining stocks had just underperformed gold for the first time in weeks. Yet, before the day was over, the USD, gold and silver had all reversed and erased most of their daily moves. Does it make the outlook bullish again? 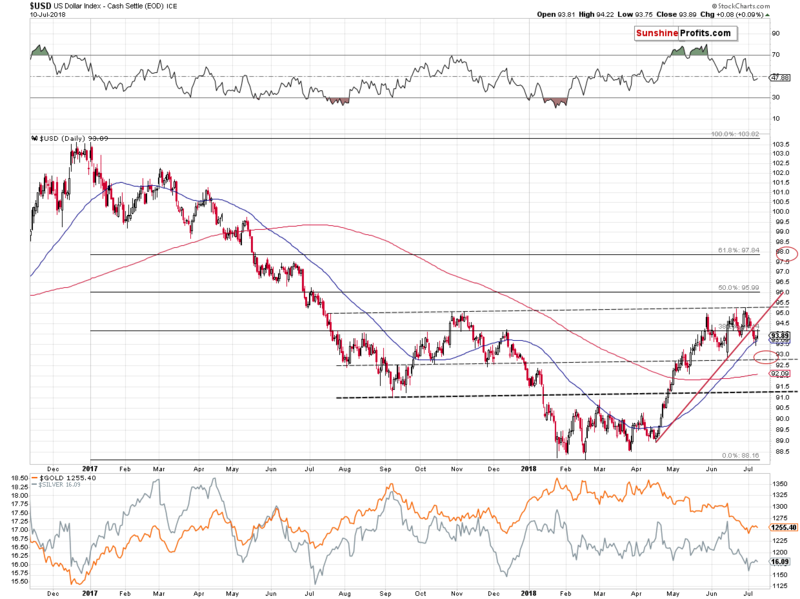 Is gold still likely to reach $1,300 shortly? No. The USD Index indeed reversed its course, but the precious metals' initial reaction shows how vulnerable they are with regard to the rallies in the USD Index. This is not the kind of reaction that one wants to see when keeping a long position. It's the one that is preferred while holding a short one. Let's take a look at the charts for details. 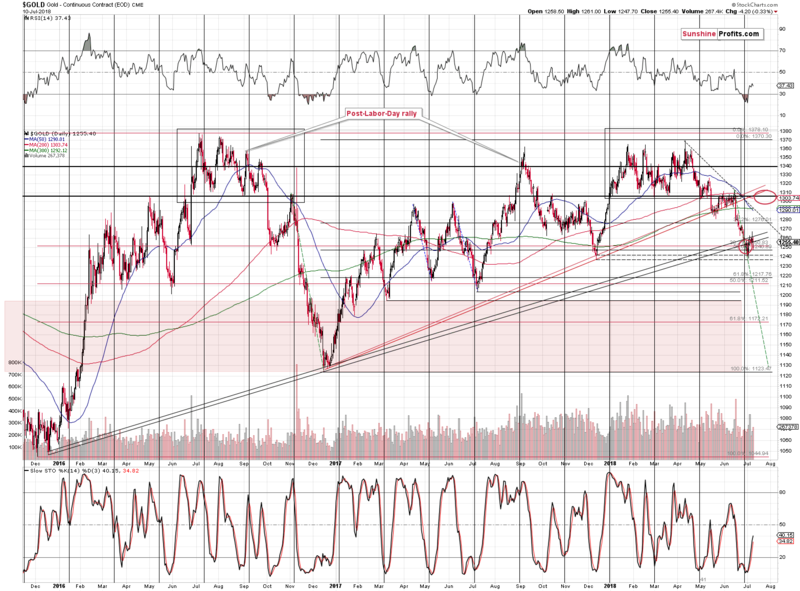 This time, we'll start with the USD Index (charts courtesy of http://stockcharts.com). During a real, sizable upswing, gold usually reacts in a most profound way to the USD's weakness in the initial part of the rally and the strength of the reaction diminishes as gold's rally continues. 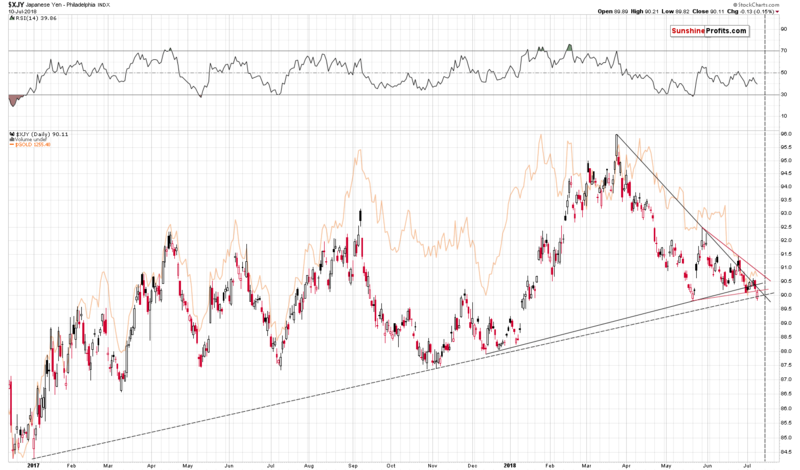 A very weak reaction to the USD's bullish signals is a sign that the rally is close to its end. Consequently, if gold was really to rally above $1,300, it should have rallied to $1,280 or so during the initial part of the rally as a response to USD Index's decline. Instead, we saw a breakdown below the medium-term support line that was based on major bottoms (late 2015 and late 2016 price extremes). Gold was likely to rally based on multiple factors - and it did - but, instead of invalidating the breakdown and rallying to $1,300 (which seemed quite realistic given the previous oversold situation in terms of the RSI indicator), gold just moved back to the rising support line and verified it as resistance. On a short-term basis, we see that yesterday's decline took place on volume that was higher than Monday's move up, which is a bearish sign. That's one of the reasons that confirms that taking profits off the table and closing our previous short-term long position in the precious metals market was indeed a good idea. Silver moved back up after the overnight decline, but it closed the session below the previous day's closing price. What's really important is that silver closed the day below the previous lowest close of the year ($16.13). 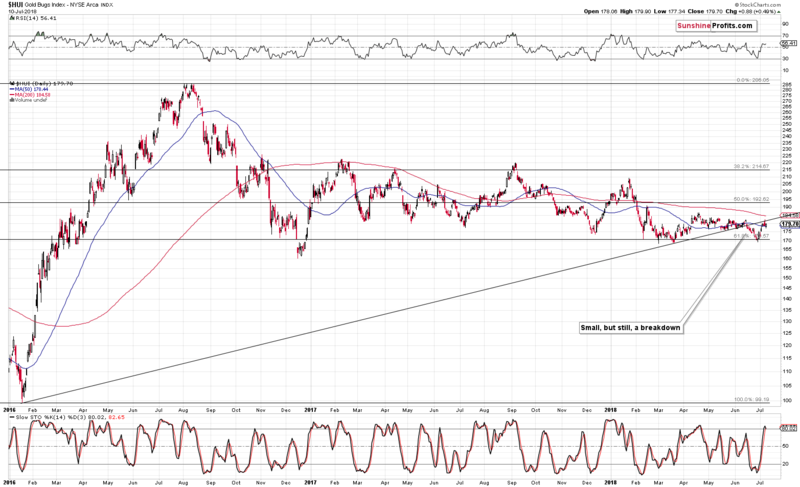 This means that - in analogy to gold - silver broke below an important support level (previous 2018 lows) and the recent rally was just a verification of the breakdown. In general, it's one of the best trading techiniques (here: for shorting) when a market is after a breakdown and then it confirms it by moving back to the previous support and verifies it as resistance. That's what just happened in gold and what happened in silver. Both precious metals had good technical reasons to rally back above the mentioned support/resistance levels - but they didn't manage to do so. This indicates that the short-term outlook can no longer be described as bullish. The HUI Index just moved to its June high and - more importantly - to its rising medium-term resistance line, below which it broke a few weeks ago. From the technical point of view, the breakdown was simply verified - the above chart (on its own) has no bullish implications. It has bearish ones. 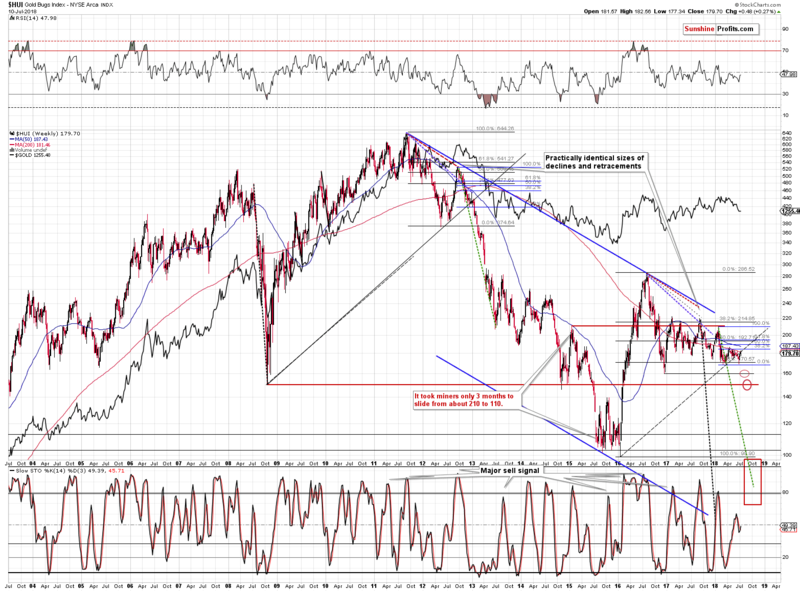 The implications are bearish for the entire precious metals sector in general. The above indicates that the days of the gold stocks' outperformance relative to gold are over and that we saw an important turnaround in the PM market in general. 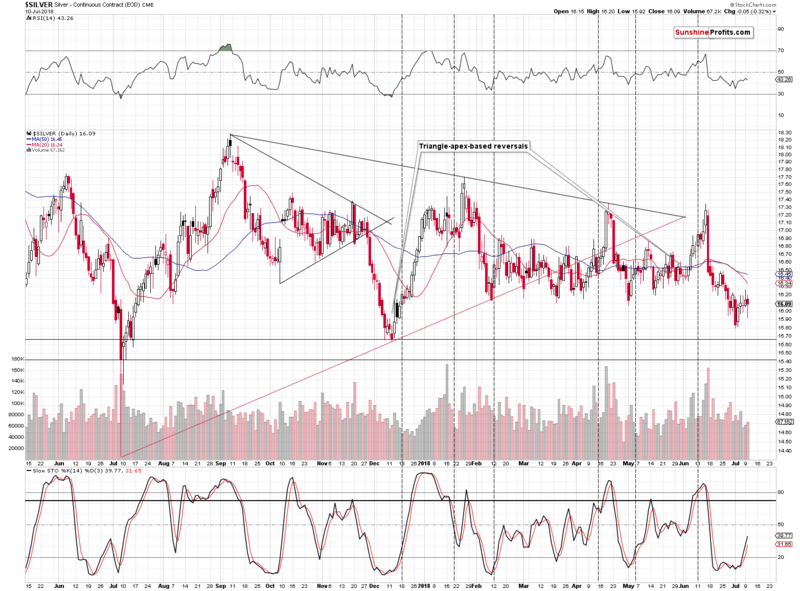 There's also a subtle bearish sign from the Japanese yen. Naturally, a breakdown below the medium-term line would have been an even more profound sign, but given today's pre-market move lower in the yen, it seems that we might see it shortly anyway. The implications for the precious metals market are already bearish and it seems that they may become much more bearish shortly. Summing up, due to several developments, the outlook for the precious metals market in the short-term is no longer bullish, but bearish. The mining stocks' underperformance on Monday, the HUI reaching its target, the HUI to gold ratio at a critical resistance, the relative strength of gold vs. the USD, the partial breakdown in the Japanese yen all point to lower precious metals prices. If you'd like to receive follow-ups to the above analysis, we invite you to sign up to our gold newsletter. You'll receive our articles for free and if you don't like them, you can unsubscribe in just a few seconds. Sign me up!